Braided is a range of items with a very clear and plain shape. The lighting part of these pieces is blown glass, while the main frame is in wicker. The shape of the glass allows for different directions of the light which creates a stunning visual display in your room. 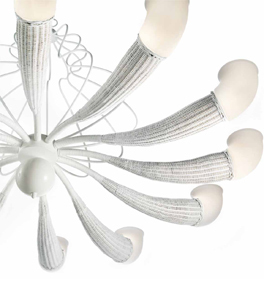 This collection includes chandeliers, flush fitting chandeliers and wall lights.